Leroy-Somer offers a wide range of nuclear motors used for driving auxiliaries, such as pumps, fans, valves, handling and compressors, either inside reactor building or inside conventional islands in nuclear power plants. Designed to withstand the severe constraints of this industry, the Leroy-Somer low voltage induction nuclear motors range from 0.55 to 750 kW and are available with air- or liquid cooling, depending on the application. They use the most up-to-date design techniques which provide a high level of robustness and reliability. 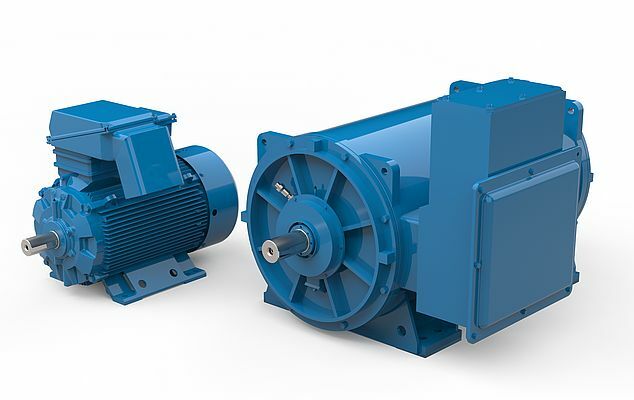 These motors satisfy the requirements of the main standards in force in the nuclear sector, notably qualification processes according to K1 - K2 - K3AD - K3, IEEE 1EB - 1EC, and have been designed in accordance with the most demanding technical and quality procedures, such as CST 74C014- CCTR, SC1 & SC2 seismic resistance, radiation from 5 to 850 kGy, decontaminable paint, GS-R-3 – SGAQ, etc. Energy efficiency is an additional asset of the nuclear motors as they offer standard IE2-IE3 Premium efficiency level, specified in the ErP EC/640/2009 directive. Leroy-Somer also provides the nuclear sector with a wide expertize in energy power, by offering superior designed alternators for generator sets that supply emergency backup power to the nuclear industry. Optimized around specific engines and turbines to maximize reliability and lifespan, Leroy-Somer nuclear alternators range from 1 to 20 MW in low- and medium voltage. These synchronous self-excited alternators are available in auxiliary winding AREP excitation with permanent magnet inductor (PMI) and can be equiped with single or double analog AVR (Automatic Voltage Regulation). Renowned for their high-quality level, they are designed according to RCCE K3 requirement or IEEE 1E classification and can meet other nuclear design references upon request. For maximum safety, the Leroy-Somer nuclear alternators have been qualified for sismic risks and for a 40or a 60-year lifetime. Qualified by numerous electricity operators including EDF, Tractebel, CGN, Vattenfall, OKG, Rosatom…, the Leroy-Somer electric rotating machines meet the nuclear industry requirements as well as local and international standards applicable in Europe, America and China. The Company's nuclear activities comply with IAEA (International Atomic Energy Agency) nuclear quality standards such as GS-R-3, and with the General Quality Assurance Requirements of EDF (main French electricity supplier) and ENGIE ELECTRABEL (Certificate of Authorization). In addition, Leroy-Somer has recently renewed its HAF 604 certification (Design and Manufacturing) with the NNSA, the Chinese National Nuclear Safety Administration, for its motor operations. At last, all Leroy-Somer personnel involved in nuclear activities are subject to special qualification procedures to ensure they completely consider the nuclear manufacturing requirements in terms of compliance and traceability.